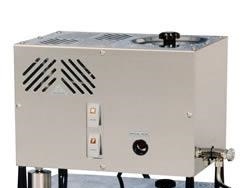 This countertop distiller can be plumbed in for automatic refilling via a feed line or filled manually through the large lid opening on the top of the distiller. Great size for condos and apartments. It produces up to 5 gallons of steam-distilled water per 24 hour period. Approximately 5 hours are required to produce one gallon of great tasting water, depending on altitude and ambient temperature. The holding tank capacity is 3 gallons. A reliable solenoid valve shuts off the distiller when the holding tank is full. This is a family-size water distiller that refills automatically. It can be installed in a laundry room or a remote location in your home. With the addition of a pump kit (PWSAPK-2), steam-distilled water can be shunted to a dedicated faucet located in your kitchen and to your fridge. It can even supply great-tasting water to a dedicated faucet at your bathroom sink. This distiller produces up to 8 gallons (US) of steam-distilled water per 24 hour period. Approximately 3 hours are required to produce one gallon of great tasting water, depending on altitude and ambient temperature. The holding has a 4 gallon capacity. A reliable solenoid valve shuts off the distiller when the holding tank is full. 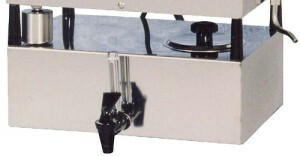 This free standing water distiller refills automatically. It can be installed in a laundry room, basement or remote location in your home. With the addition of a pump kit (PWSAPK-1), steam-distilled water can be shunted to multiple locations: a dedicated faucet located in your kitchen, your fridge, or your bathroom sink. This distiller produces up to 8 gallons (US) of steam-distilled water per 24 hour period. Approximately 3 hours are required to produce one gallon of great tasting water, depending on altitude and ambient temperature. The holding tank has an 8 gallon capacity. A reliable solenoid valve shuts off the distiller when the holding tank is full. 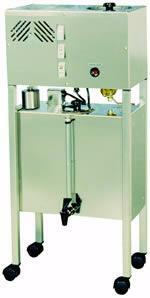 This countertop water distiller produces approximately one gallon (US) of steam-distilled water per fill up. It is filled manually through the large lid opening in the top of the distiller. The distillation cycle takes approximately 3 hours, depending on altitude and ambient temperature. At the end of the distillation cycle the distiller shuts off automatically until more water is poured in the boiling chamber. Source water is placed into the boiling chamber and brought to a boiling point. Pure steam rises to the top of the distiller and enters a baffle system, which draws steam toward a finned cooling coil system. 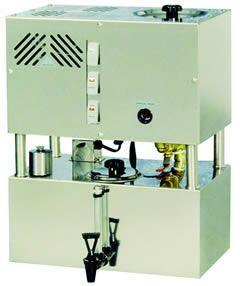 As the steam enters the cooling coil, a gas vent releases any volatile gases from the coil. Following condensing, this hot steam becomes pure water which runs through a charcoal filter and into your storage container or optional storage tank (see PWS MST below). 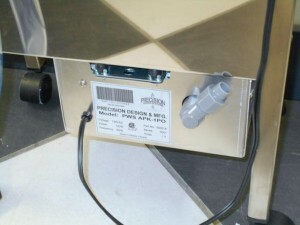 This model comes standard with a disposable post carbon filter (plastic housing). Upgrade to the reusable steel carbon filter housing. Comes with initial load of activated coconut shell carbon. Add a pump kit to your water distiller to deliver steam distilled water from a basement or laundry room to multiple locations such as a dedicated faucet at your kitchen sink and your fridge. Pump Kit contains: 1 – 5 litres per minute pump, chrome faucet, 25 ft of feed line and all the fittings required to supply one location. You can also tie into this line and deliver the distilled water to a fridge, ice maker, humidifier or anywhere else in your home (extra fittings required). Note: When pumping to several locations we recommend the aid of an accumulator tank to increase the life of the pump. The Auto Drain Kit will aid in the maintenance of your water distiller, which in turns gives the water distiller a longer life span. 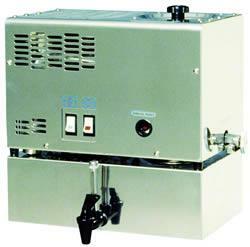 The auto drain will open and drain the boiling chamber after your unit has filled the storage tank and has shut down. This cuts down on the amount of manually cleaning required for the boiling tank. As a result of the distillation process all the bad stuff in your water gets left behind at the bottom of the boiling chamber. The longer you leave it there, the more concentrated it becomes as it bakes onto the element and inside walls of the boiling chamber. For safe, efficient and long lasting operation of your distiller, it is important to remove this residual build up regularly (before it becomes 1/8” thick). Especially recommended for hard water areas.